SGK offer a range of durable, attractive and functional canopies in a choice of styles and options. One of the huge advantages of modern double glazing is it’s low maintenance. Other than routine cleaning and care, there is little more you need to do to keep your double glazing looking like new for years to come. The low maintenance innovations in modern double glazing now also extend to other areas of your home such as your front door. 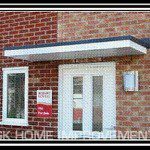 SGK offer an extensive range of attractive and highly durable canopy options. They will suit all property styles, mimicking classic materials with little or no maintenance requirements. 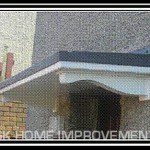 SGK Home Improvements low maintenance fibreglass canopies and porches. Our range of GRP (Glass Reinforced Plastic), maintenance free canopies are a great solution to canopies constructed from traditional building materials. 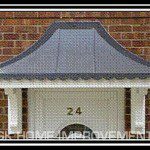 Our GRP door canopies (or entrance canopies) can instantly add a touch of class to the front of your house. Installing a fibreglass door canopy can also provide a dry welcome to your guests. Each of our front door canopies, including the fibreglass door canopy range, is easy to install and designed around you and your home. The advantages of fibreglass canopies. 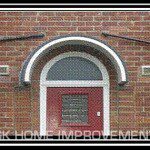 SGK Home Improvements source our products from the best known UK manufacturers of GRP door canopy & entrance canopy products. GRP has for a long time been used in the construction of aircraft and marine vessels and provides long service life, colour retention and durability in all kinds of weather. 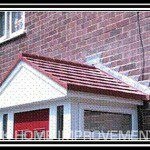 We have worked with front door canopies for over 24 years and have a lot of experience in providing you the right entrance canopy that will blend in or enhance your home. This is why we as UK manufacturers now only offer customers products made from Glassfiber Reinforced Plastic. Fitting our grp door canopies/entrance canopies saves our customers time and money by offering weather protection and scarring removal left from previous canopies. 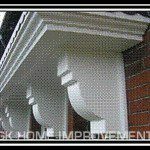 We offer a choice of traditional or modern designs. All our canopies are of exceptional quality and built to last. Cost effective canopies that are a feature of your home. High quality materials, expertly installed by your local experts. Entrance canopies to suit all tastes and budgets. We offer a large range of designs from the period/traditional up to the most modern. All come in a choice of materials and colours. View or download a full price list by clicking here.